Start your morning right with a handy kitchen essential. 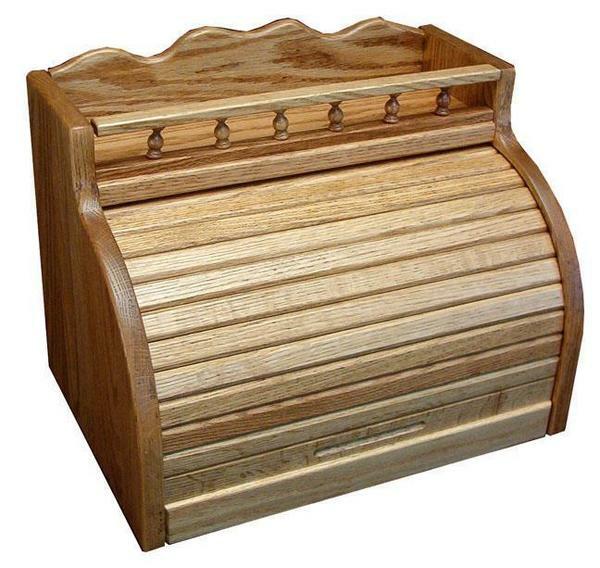 The Amish Hardwood Roll Top Bread Box with Spice Storage Rail combines a handy bread box and spice rail in one. This wood bread box emits a warm feeling with its tambour style door (just like a roll-top desk door) and decorative spice rack. Handcrafted of solid wood, this is a bread box that makes a great gift for loved ones. Measures 16" by 11" by 12"
The bread box has long been relied upon for keeping bread the freshest. Enjoy the best with your own custom made bread box. In addition, keep spices organized and a neat kitchen counter with the wood spice rack. Easy to grab from the counter and you're on your way to a fine breakfast. Browse our collection of bread boxes made by the Amish. All sides of the bread box are constructed from solid oak or cherry wood except the back, which is made in plywood of the same species. The bread is stored behind the roll top tambour that easily rolls up or down. If you love roll top desks then you will surely love this roll top breadbox. This bread box is Amish handcrafted in Indiana. Please contact a Furniture Specialist with any questions. We can be reached via email or phone. Thank you for shopping with DutchCrafters. 16" x 11" x 12"
Additional Stains Are Available - Please Call to Inquire. Thank you so much Savannah... It looks beautiful! Thank you again so very much for all your care & attention!! !